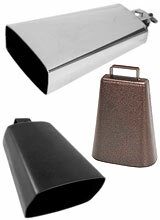 All transactions are safe and secure with a reliable history in online purchasing behind our associates. 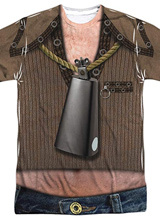 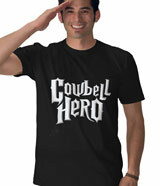 Buy SNL more cowbell t-shirts and Gene Frenkle costumes for the Will Ferrell video skit with Christopher Walken. 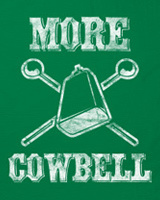 During a Saturday Night Live comedy sketch on April 8, 2000, the catchphrase "more cowbell" was immortalized into pop culture history. 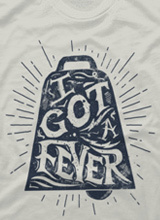 The SNL sketch features Will Ferrell as cowbell player Gene Frenkle and guest host Christopher Walken as record producer Bruce Dickinson, both fictional characters. 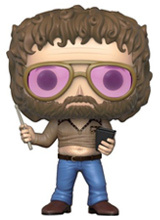 The skit is a take on VH1's Behind the Music, and it begins with 1976 footage of Ferrell's Frenkle in a studio recording the song "(Don't Fear) The Reaper" with the band Blue Oyster Cult. 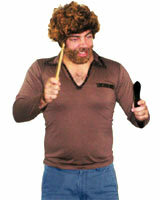 Gene Frenkle (Will Ferrell) plays the cowbell so annoyingly it forces the rest of the band to stop twice. 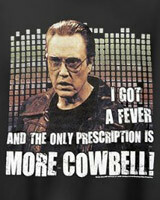 However, producer Dickinson (Walken) likes Frenkle's sound and exclaims, "Guess what! 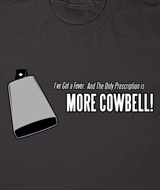 I got a fever, and the only prescription... is more cow bell!" 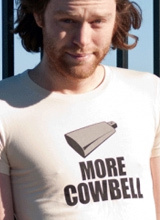 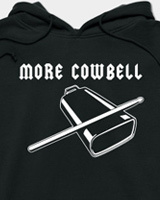 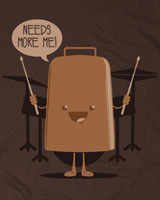 Browse our SNL More Cowbell shirts below.